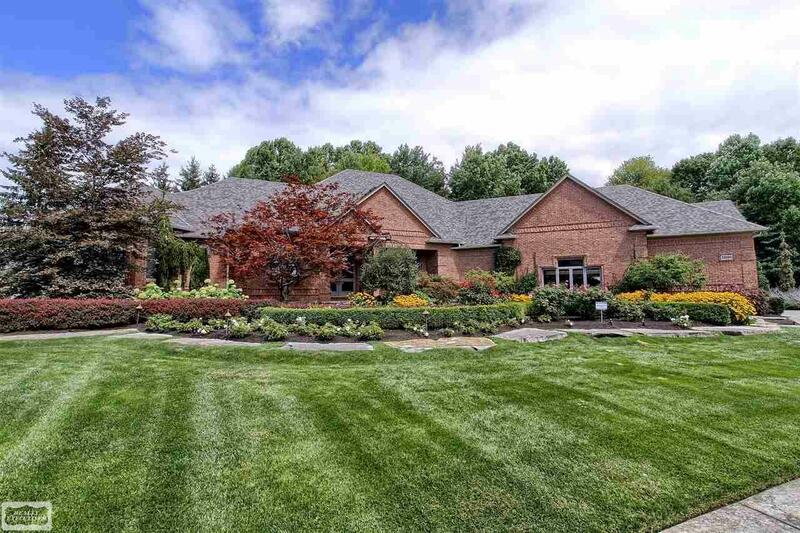 Rare Find at end of cul-de-sac on over 1/2 acre private pie shaped lot, stunning great room ranch w/fully finished walkout basement to resort style in-ground swimming pool, over 6,000 sq. ft. of finely appointed living area in this entertainer&apos;s dream house. Features all high end finishes, Nuvo wireless sound system, open floor plan w/large gourmet island kitchen, commercial grade appliances, finished walkout lower level features 2nd high-end kitchen, deluxe wine bar, 2 additional bedrooms, 2nd full laundry & bath with steam shower; features gourmet kitchen w/built-in BBQ/pizza oven, huge wet bar, refrigerators all hidden away in ultimate plush landscaped private yard with pond & waterfall, brick paver driveway & walkways, upper deck off kitchen & master bedroom, huge lower patio, 3.5 car garage w/additional 20&apos; x 14&apos; workshop plus finished upstairs storage room, premier cabinetry & power lifts for toys. Roof is 2 years old with lifetime warranty.